Lots has been going on chez Varwell, and today is being spent on various chores rather than writing. Tomorrow sees the start of a full and travel-packed working week with Stornoway on Wednesday and Edinburgh on Thursday and Friday. 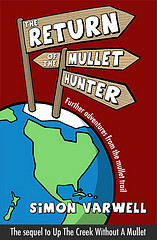 I had told myself that with the launch of “Up The Creek Without A Mullet” I’d not take my eye off the ball of putting finger to keyboard on what I hope will be the sequel. However, Mondays (which I take off so I can try to write) have lately been eaten up with various unavoidable bits and pieces, including travel for work, and it might be a frustrating couple of weeks before I can properly get stuck in. 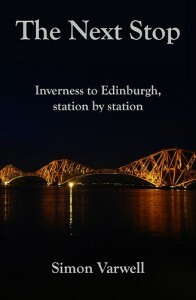 I am casting my mind, however, to tomorrow night, when I am speaking to the Highland Literary Salon. As I mentioned before, this is a gathering of local writers, and I have been asked to talk about writing alternative travel narrative, writing humour (yes, I think that means my jokes are now officially good), and the process of getting published. That’s all fine, but I need to think about what extracts to read as an opening. 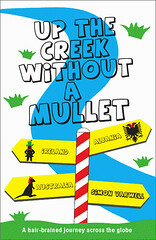 If you have have any suggestions of parts of “Up The Creek Without A Mullet” which are particularly evocative of humour or travel (what do you mean you’ve not read it yet? ), then post your thoughts below. Oh, and tomorrow night’s event is open to all – Glen Mhor Hotel, Inverness, 7.30pm – but I’ve been warned by the gaffers at HLS HQ that because it will be a gathering of writers, “things could get geeky toward the end”. Monday 15 February 2010 in Writing. Not sure if you’ll know who I am, but we saw you at the salon and stayed chatting with you until the end. I was the one who suggested doing audio excerpts and placing them on your site. Just a quick note to say that you were an excellent guest author at last night’s salon (especially given that, owing to having a colleague cry-off sick at the last moment, you ended up doing the whole thing yourself). Thanks for bringing your excellent book along, I loved the parts you read and also the bits I scanned afterwards, as the book was being passed around. I’ll be buying it today! Christielli – thanks yes it is exciting, but plenty other adjectives too, such as scary, exhilirating, confusing and more besides! Sorry it’s got such a long timescale for Canada. I think it’s the same for most of the overseas availability. Fingers crossed there’ll be an ebook soon – watch this space. And hi Tony, yes good to meet you last night. Thank you, I am glad you enjoyed the talk; I certainly did and took a lot from it myself (will think about that audio extract idea, for instance). Thanks for buying the book!